Heading Tags (h1, h2, h3, h4, h5) of a website are very important for SEO (Search Engine Optimization). All of Blogger widgets (gadgets) titles use h3 or h2 tags. 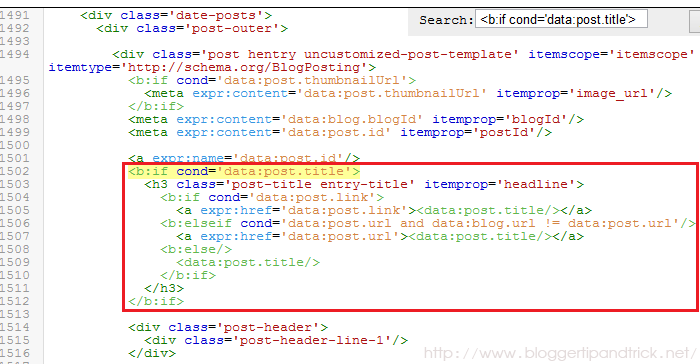 Many blogger templates are using h2 or h3 tags for post titles. But If you are looking for ways to improve your site SEO, using h1 tags for post titles is a one way to do it. 2.Now you have to find the code responsible for creating post tiles. Note: These codes have some differences according to your template. If you can't find code 1 or code 2, search it replacing h3 with h2. 4.Click on "Save template" and now you are done. It doesnt change on my blog it stays red? What is your blog URL. I looked all over for a simple answer to this! Great succinct post! Thank you for such a useful article. The information presented will help everyone that reads it. Please continue to elaborate on this subject as I’m sure there will be more need for information on this in the future. thank you for tips and trick all about blog. Thank you for this, very easy to follow guide. I hope this will bring more traffic to my site. Hi, it seems interesting. I only have a question: when I use "View Selection Source" on your website I see your post title is h3 tag (class), not h1. Is there a reason for you not to have post title h1? I just want to be sure nothing new happen after you wrote this post (I don`t want to be penalized by Google). The same thing with descriptionwrapper. Hey I am trying to use a twitter widget in the body of a post but I get the h3 "Arrow" in the middle of it. Any way to remove? I have a Small Doubt - Are u using the h1 tag for post title for this blog ? I have found that your using h3 tag for post title . Yes.I am using h3 tag for post titles,because there are some problems of my template,when I change it to h1 tag. This post was very Helpful Thanks! Can you please take a look at my blog, http://dishnetwork-dishtv.blogspot.com I'm having some trouble with this and would like to get it right. thanks you, it help me alot..and im using it right now..
First of all I am very thankful to you this kind informations about seo , Now I ill come to the point , as you describe above i replace the code h2 to h1 ( I change the complete code), when i check with Meta tags analysis it says NO TITLE FOUND. I just wanted to know where I should enter the TITLE ? I just added this code to my blog. Then what happen our blog main Title? It should be H1 tag or not? I applied the code above but when I check my H1 tag with aboutus.org, it appears that my heading tag is “Subscribe via RSS Subscribe via Email Follow Me on Twitter Add me on Facebook”. How to solve it please? I am having trouble finding the first section of code even after I replace h3 with h2 and I have not forgotten to expand widget templates option. Traffic Travis, in the page analysis section, is telling me that I am getting a B+ which i think will become an A if I can just get the H1 tags as my keyword! Love your SEO site btw! Some great info! Error parsing XML, line 1635, column 9: The element type "h1" must be terminated by the matching end-tag "". I am using the Awesom template. You probably just need to change the closing tags to to fix that. I got an error or two setting up http://cormacscanlan.blogspot.com/ like this, but it seems to be good now. Anyway, thanks for posting, this was useful! "You probably just need to change the closing tags (/h3) to (/h1) to fix that." Thank you for the tip. I changed my blog's H3 to H1. These are excellent tips. H1 tags are now important for good SEO. I wish this trick will work for my blog but it can't because there is h3 for mobile tag should I change it, too? Cool Stuff and very usefull..
how about H4 H5 and H6 brother? I managed to find re-write my header widgets (bloggers that is). Totally forgotten about the existing posts tags.. Thanks for this useful post! But yes on the post pages we can give the h1 tag to the the post title and reduce the importance of the Blog Title. But How Can I do this ??? can you give as a code for this or this code will work ?? I am trying to apply my blog and hope getting a best result after including h1 tag. i tried this tip and now I have "Pages" real big over my page tab. How do I get rid of this? Hi, what is your blog url? I got there two h3 class='post-title entry-title'. what needs to be replaced all the h1 class='post-title entry-title'..? Thanks a lot.Just make changes on my blog. What i should do H2 or H1 ? Which is more good according to you ? I am still seeing h3 tag in my blog post title. Can anyone tell me what should i do to change my blog post title from h3 to h1. FYI my blog template does not have "" section. Thanks. you have edited wrong code. please read tutorial again. Oops. Thanks a lot for correcting me. Its really helpful. I have made a lot of changes in my blog after seeing this site. Thanks a lot. Should I change both ? Should I change h3 to h2 OR h1 ? I hope after i change my html code,i will a better in seo,thanks for the info bro..
can't find "]]>" in my HTML why? If i use the H1 tag on the page then it looks odd. Can we use css so we can make it smaller and it look attractive also. Good idea with those headings.